In this sense EVAS focuses on quality which promotes a culture resulting to well behavior, attitude, activities and processes to deliver value by fulfilling needs and expectations of customers and other relevant parties. 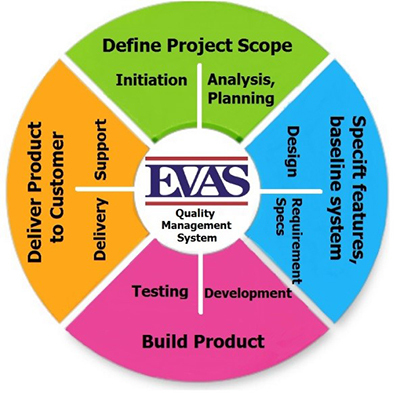 EVAS owns quality management system (ISO 9001, EN ISO 3834-2, 2010/35/EU In-house Inspection Service), an inspection unit that is independent from production department and a laboratory capable of carrying out non-destructive tests, destructive tests and performance tests for product verification purposes. Inspection during manufacturing includes measuring, examining, testing, or gauging one or more characteristics of a product or process and comparing the results with specified requirements to determine whether the requirements are met. Inspection activities are performed by a competent team independent of production. Products are monitored in all stages of the product realization. Product verification is carried with the data collected and resulted from monitoring activities. Product identification, recording and monitoring process parameters are done through PLC (Programmable Logic Controller). Records of compliance with the acceptance criteria are maintained. 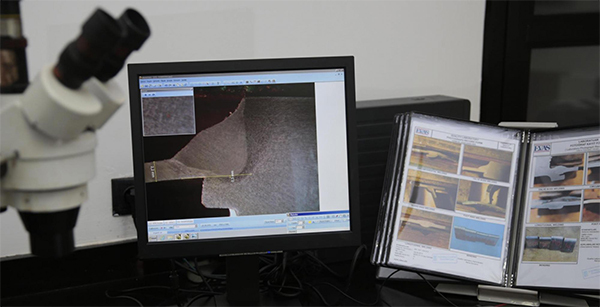 All destructive and nondestructive tests for verification of product are carried out during incoming control tests, type approval tests, pre-production and during production control activities. Pressurized steel cylinder is an essential product which needs special attention starting from supply of raw materials and semi-finished products. EVAS follows a strict examination procedure during supplier's selection and only works with approved and listed suppliers. In the scope of incoming material control, valve boss inspection, material hardness measurement, material conformity assessment tests, valve control, paint conformity assessment, plate conformity assessment are carried out.